Methyl ethyl ketone peroxide (MEKP) is a colorless, organic peroxide similar to acetone peroxide. MEKP is an oily liquid whereas acetone peroxide is a white powder. MEKP is combustible and contains an explosive decomposition at 230°F. MEKP is heavily used in the chemical and plastic industry for manufacturing initiators for curing unsaturated polyester resins used in glass-reinforced plastic and casting. MEKP is is extremely destructive to tissue of the mucous membranes, upper respiratory tract, skin and eyes. It is a severe skin irritant and has the ability to cause progressive corrosive damage and/or blindness. MEKP is incompatible with organic materials, forms of heat (including flames, sparks and sunlight). Ignition and/or explosion may occur if mixed with readily oxidizable materials. MEKP Reacts with combustible substances including wood, cloth, chlorine, and metals (copper, iron and their alloys and aluminum and its alloys). It is also incompatible with heavy metals, acids and bases. MEKP storage building by US Chemical Storage. MEKP storage containers must be closed to prevent contamination, while rotating inventory using FIFO storing standards to use the oldest inventory first. MEKP storage must be stored at 80°F or below to maintain chemical stability. Prolonged storage at above 80°F can cause gassing, inventory degradation and/or potential container rupture which can result in a fire or explosion. Store MEKP using fire-rated chemical storage buildings with necessary accessories including climate control, mechanical ventilation and fire suppression systems. Personal protection is mandatory when transferring or working with MEKP storage. Utilize personal protection equipment the follow the safety recommendations outlined below. Wear a NIOSH/MSHA approved air-purifying respirator if airborne concentrations are expected to exceed acceptable levels. Work clothing that becomes contaminated should be removed and replaced. Eyewash fountains should be provided in areas where there is risk of chemical exposure. An Emergency Response Plan should be in place in case of an accident. Label containers properly by contacting the chemical manufacturer. 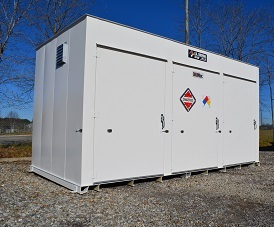 For more information regarding MEKP storage buildings contact US Chemical Storage online or call 1-800-233-1480 for a free chemical storage consultation.